Art is an essential aspect of any civilization. Once the basic human needs have been taken care of such as food, shelter, some form of community law, and a religious belief, cultures begin producing artwork, and often all of these developments occur more or less simultaneously. This process began in the Predynastic Period in Egypt (c. 6000 - c. 3150 BCE) through images of animals, human beings, and supernatural figures inscribed on rock walls. These early images were crude in comparison to later developments but still express an important value of Egyptian cultural consciousness: balance. Egyptian society was based on the concept of harmony known as ma'at which had come into being at the dawn of creation and sustained the universe. All Egyptian art is based on perfect balance because it reflects the ideal world of the gods. The same way these gods provided all good gifts for humanity, so the artwork was imagined and created to provide a use. Egyptian art was always first and foremost functional. No matter how beautifully a statue may have been crafted, its purpose was to serve as a home for a spirit or a god. An amulet would have been designed to be attractive but aesthetic beauty was not the driving force in its creation, protection was. Tomb paintings, temple tableaus, home and palace gardens all were created so that their form suited an important function and, in many cases, this function was a reminder of the eternal nature of life and the value of personal and communal stability. The value of balance, expressed as symmetry, infused Egyptian art from the earliest times. The rock art from the Predynastic Period establishes this value which is fully developed and realized in the Early Dynastic Period of Egypt (c. 3150 - c. 2613 BCE). Art from this period reaches its height in the work known as The Narmer Palette (c. 3200-3000 BCE) which was created to celebrate the unity of Upper and Lower Egypt under King Narmer (c. 3150 BCE). Through a series of engravings on a siltstone slab, shaped as a chevron shield, the story is told of the great king's victory over his enemies and how the gods encouraged and approved his actions. Although some of the images of the palette are difficult to interpret, the story of unification and the celebration of the king is quite clear. On the front, Narmer is associated with the divine strength of the bull (possibly the Apis Bull) and is seen wearing the crown of Upper and Lower Egypt in a triumphal procession. Below him, two men wrestle with entwined beasts which are often interpreted as representing Upper and Lower Egypt (though this view is contested and there seems no justification for it). The reverse side shows the king's victory over his enemies while the gods look on approvingly. All these scenes are carved in low-raised relief with incredible skill. This technique would be used quite effectively toward the end of the Early Dynastic Period by the architect Imhotep (c. 2667-2600 BCE) in designing the pyramid complex of King Djoser (c. 2670 BCE). Images of lotus flowers, papyrus plants, and the djed symbol are intricately worked into the architecture of the buildings in both high and low relief. By this time the sculptors had also mastered the art of working in stone to created three-dimensional life-sized statues. The statue of Djoser is among the greatest works of art from this period. 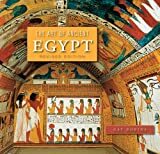 This skill would develop during the Old Kingdom of Egypt (c. 2613-2181 BCE) when a strong central government and economic prosperity combined to allow for monumental works like the Great Pyramid of Giza, the Sphinx, and elaborate tomb and temple paintings. The obelisk, first developed in the Early Dynastic Period, was refined and more widely used during the Old Kingdom. Tomb paintings became increasingly sophisticated but statuary remained static for the most part. A comparison between the statue of Djoser from Saqqara and a small ivory statue of King Khufu (2589-2566 BCE) found at Giza display the same form and technique. Both of these works, even so, are exceptional pieces in execution and detail. Art during the Old Kingdom was state mandated which means the king or a high-ranking nobility commissioned a piece and also dictated its style. This is why there is such uniformity in Old Kingdom artwork: different artists may have had their own vision but they had to create in accordance with their client's wishes. This paradigm changed when the Old Kingdom collapsed and initiated the First Intermediate Period (2181-2040 BCE). The First Intermediate Period has long been characterized as a time of chaos and darkness and artwork from this era has been used to substantiate such claims. The argument from art rests on an interpretation of First Intermediate Period works as poor quality as well as an absence of monumental building projects to prove that Egyptian culture was in a kind of free fall toward anarchy and dissolution. In reality, the First Intermediate Period of Egypt was a time of tremendous growth and cultural change. The quality of the artwork resulted from a lack of a strong central government and the corresponding absence of state-mandated art. The quality of the artwork resulted from a lack of a strong central government & the corresponding absence of state-mandated art. The different districts were now free to develop their own vision in the arts and create according to that vision. There is nothing 'low quality' about First Intermediate Period art; it is simply different from Old Kingdom artwork. The lack of monumental building projects during this time is also easily explained: the dynasties of the Old Kingdom had drained the government treasury in creating their own grand monuments and, by the time of the 5th Dynasty, there were no resources left for such projects. The collapse of the Old Kingdom following the 6th Dynasty certainly was a time of confusion, but there is no evidence to suggest the era which followed was any kind of 'dark age'. The First Intermediate Period produced a number of fine pieces but also saw the rise of mass-produced artwork. Items which had previously been made by a single artist were now assembled and painted by a production crew. Amulets, coffins, ceramics, and shabti dolls were among these crafts. Shabti dolls were important funerary objects which were buried with the deceased and were thought to come to life in the next world and tend to one's responsibilities. These were made of faience, stone, or wood but, in the First Intermediate Period, are mostly of wood and mass produced to be sold cheaply. Shabti dolls were important items because they would allow the soul to relax in the afterlife while the shabti did one's work. Previously, only the wealthy could afford shabti dolls, but in this era, they were available to those of more modest means. The First Intermediate Period ended when Mentuhotep II (c. 2061-2010 BCE) of Thebes defeated the kings of Herakleopolis and initiated the Middle Kingdom of Egypt (2040-1782 BCE). Thebes now became the capital of Egypt and a strong central government again had the power to dictate artistic taste and creation. The rulers of the Middle Kingdom, however, encouraged the different styles of the districts and did not mandate that all art conform to the tastes of the nobility. Although there was great reverence for Old Kingdom art and, in many cases, an obvious attempt to reflect it, Middle Kingdom Art is distinctive in the themes explored and the sophistication of the technique. The Middle Kingdom is usually regarded as the high point of Egyptian culture. The tomb of Mentuhotep II is itself a work of art, sculpted from the cliffs near Thebes, which merges seamlessly with the natural landscape to create the effect of a wholly organic work. The paintings, frescoes, and statuary which accompanied the tomb also reflect a high level of sophistication and, as always, symmetry. Jewelry was also refined greatly at this time with some of the finest pieces in Egyptian history dated to this era. A pendant from the reign of Senusret II (c. 1897-1878 BCE) which he gave to his daughter is fashioned of thin gold wires attached to a solid gold backing inlaid with 372 semi-precious stones. The statues and busts of kings and queens are intricately carved with a precision and beauty lacking in much of the Old Kingdom artwork. The most striking aspect of Middle Kingdom art, however, is the subject matter. Common people, instead of nobility, feature more often in art from this period than any other. The influence of the First Intermediate Period continues to be seen in all the art from the Middle Kingdom, where laborers, farmers, dancers, singers, and domestic life receive almost as much attention as kings, nobles, and the gods. Artwork in tombs continued to reflect the traditional view of the afterlife, but literature from the time questioned the old belief and suggested that one should concentrate on the only life one could be sure of, the present. This emphasis on life on earth is reflected in less idealistic and more realistic artwork. Kings like Senusret III (c. 1878-1860 BCE) are depicted in statuary and art as they really were instead of as ideal kings. Scholars recognize this by the uniformity and detail of the representations. Senusret III is seen in different works at different ages, sometimes looking careworn, sometimes victorious, whereas kings of earlier eras were always shown at the same age (young) and in the same way (powerful). Egyptian art is famously expressionless because the Egyptians recognized that emotions are fleeting and one would not want one's eternal image to reflect only one moment in life but the totality of one's existence. Middle Kingdom art adheres to this principle while, at the same time, hinting more at the subject's emotional state than in earlier eras. However the afterlife was viewed at this time, the emphasis in art always gravitates to the here-and-now. Images of the afterlife include people enjoying the simple pleasures of life on earth like eating, drinking, and sowing and harvesting a field. The detail of these scenes emphasizes the pleasures of life on earth, which one should make the most of. Dog collars during this time also become more sophisticated which suggests more leisure time for hunting and greater attention to the ornamentation of simple daily objects. The Middle Kingdom began to dissolve during the 13th Dynasty when the rulers had grown too comfortable and neglected the affairs of state. The Nubians encroached from the south while a foreign people, the Hyksos, gained a substantial foothold in the Delta region of the north. The government at Thebes lost control of large sections of the Delta to the Hyksos and could do nothing about the growing power of the Nubians; it became increasingly obsolete and ushered in the era known as the Second Intermediate Period (c. 1782 - c. 1570 BCE). During this time the government at Thebes continued to commission artwork but on a smaller scale while the Hyksos either appropriated earlier works for their temples or commissioned for grander works. The art of the Second Intermediate Period of Egypt continued the traditions of the Middle Kingdom but often less effectively. The best artists were available to the nobility at Thebes and produced high-quality work, but non-royal artists were less skilled. This era, like the first, is also often characterized as disorganized and chaotic, and the artwork held up as proof, but there were many fine works created during this time; they were simply on a smaller scale. Tomb paintings, statuary, temple reliefs, pectorals, headdresses, and other jewelry of high quality continued to be produced and the Hyksos, though often vilified by later Egyptian writers, contributed to cultural development. They copied and preserved many of the written works of earlier history which are still extant and also copied statuary and other artworks. The Hyksos were finally driven out by the Theban prince Ahmose I (c. 1570-1544 BCE) whose rule begins the period of the New Kingdom of Egypt (c. 1570 - c. 1069 BCE). The New Kingdom is the most famous era of Egyptian history with the best-known rulers and most recognizable artwork. The colossal statues which were initiated in the Middle Kingdom became more common during this time, the temple of Karnak with its great Hypostyle Hall was expanded regularly, the Egyptian Book of the Dead was copied with accompanying illustrations for more and more people, and funerary objects like shabti dolls were of higher quality. Egypt of the New Kingdom is the Egypt of empire. As the borders of the country expanded, Egyptian artists were introduced to different styles and techniques which improved their skills. The metalwork of the Hittites which the Egyptians made use of in weaponry also influenced art. The wealth of the country was reflected in the enormity of individual artworks as well as their quality. The pharaoh Amenhotep III (1386-1353 BCE) built so many monuments and temples that later scholars attributed to him an exceptionally long reign. Among his greatest works are the Colossi of Memnon, two enormous statues of the seated king rising 60 ft (18 m) high and weighing 720 tons each. When they were built they stood at the entrance to Amenhotep III's mortuary temple, which is now gone. Amenhotep III's son, Amenhotep IV, is better known as Akhenaten (1353-1336 BCE), the name he chose after devoting himself to the god Aten and abolishing the ancient religious traditions of the country. During this time (known as the Amarna Period) art returned to the realism of the Middle Kingdom. From the beginning of the New Kingdom, artistic representations had again moved toward the ideal. During the reign of Queen Hatshepsut (1479-1458 BCE), although the queen is depicted realistically, most portraits of nobility show the idealism of Old Kingdom sensibilities with heart-shaped faces and smiles. The art of the Amarna period is so realistic that modern-day scholars have been able to reasonably suggest what physical ailments people in the pictures probably suffered from. Two of the most famous works of Egyptian art come from this time: the bust of Nefertiti and the golden death mask of Tutankhamun. Nefertiti (c. 1370-1336 BCE) was Akhenaten's wife and her bust, discovered at Amarna in 1912 CE by the German archaeologist Borchardt is almost synonymous with Egypt today. Tutankhamun (c.1336-1327 BCE) was Akhenaten's son (but not Nefertiti's) who was in the process of dismantling his father's religious reforms and returning Egypt to traditional beliefs when he died before the age of 20. He is best known for his famous tomb, discovered in 1922 CE, and the vast number of artifacts it contained. The golden mask and other metal objects found in the tomb were all the result of innovations in metalwork learned from the Hittites. The art of the Egyptian Empire is among the greatest of the civilization because of the Egyptian's interest in learning new techniques and styles and incorporating them. Prior to the arrival of the Hyksos in Egypt, Egyptians thought of other nations as barbaric and uncivilized and did not consider them worthy of any special attention. The Hyksos 'invasion' forced the people of Egypt to recognize the contributions of others and make use of them. The skills acquired would continue through the Third Intermediate Period of Egypt (c. 1069-525 BCE) and Late Period (525-332 BCE), which are also negatively compared with the grander eras of a strong central government. The style of these later periods was affected by the times and the limited resources, but the art is still of considerable quality. Egyptologist David P. Silverman notes how "the art of this era reflects the opposing forces of tradition and change" (222). The Kushite rulers of the Late Period of Ancient Egypt revived Old Kingdom art in an effort to identify themselves with Egypt's oldest traditions while native Egyptian rulers and nobility sought to advance artistic representation from the New Kingdom. This same paradigm holds with Persian influence following their invasion of 525 BCE. The Persians also had great respect for Egyptian culture and history and identified themselves with Old Kingdom art and architecture. The Ptolemaic Period (323-30 BCE) blended Egyptian with Greek art to create statuary like that of the god Serapis - himself a combination of Greek and Egyptian gods - and the art of the Roman Egypt (30 BCE - 646 CE) followed this same model. Romans would draw on the older Egyptian themes and techniques in adapting Egyptian gods to Roman understanding. Tomb paintings from this time are distinctly Roman but follow the precepts begun in the Old Kingdom. The art of these later cultures would come to influence European understanding, technique, and style which would be adhered to for over 1,000 years until artists in the late 19th century CE, such as the Futurists of Italy, began breaking with the past. So-called Modern Art in the early 20th century CE was an attempt to force an audience to see traditional subjects in a new light. Artists like Picasso and Duchamp were interested in forcing people to recognize their preconceptions about art and, by extension, life in creating unexpected and unprecedented compositions which broke from the past in style and technique. Their works and those of others were only possible, however, because of the paradigm created by the ancient Egyptians. David, R. The Handbook to Life in Ancient Egypt. (Oxford University Press, 2003). Mark, Joshua J. "A Brief History of Egyptian Art." Ancient History Encyclopedia. Last modified May 30, 2017. https://www.ancient.eu/article/1077/. Mark, Joshua J. "A Brief History of Egyptian Art." Ancient History Encyclopedia. Ancient History Encyclopedia, 30 May 2017. Web. 25 Apr 2019. Submitted by Joshua J. Mark, published on 30 May 2017 under the following license: Creative Commons: Attribution-NonCommercial-ShareAlike. This license lets others remix, tweak, and build upon this content non-commercially, as long as they credit the author and license their new creations under the identical terms. Please note that content linked from this page may have different licensing terms.